Eagle Technology’s LocalMaps gives you the power to create purposeful information products that are easily accessible to your entire organisation. Highly regarded for its intuitive user interface, flexible configuration options and strong user community, LocalMaps offers a reliable and proven solution that meets the needs of New Zealand’s diverse industries and organisations. LocalMaps is a powerful web based solution for viewing, querying and reporting on your organisation's spatial data. Offering flexible deployment options, data level integration to existing databases (SQL Server, MySQL, Oracle and more), LocalMaps fits all your internal and/or public facing Web GIS needs. See the LocalMaps Technical Requirements for more detail. LocalMaps has made the publishing and managing of our GIS content really easy. The interface is also easy to use...one email (from a staff member) had a subject of 'WOW WOW WOW'; I think that says it all! Share district management plans, inform about upcoming projects and promote interesting places and environments around the city or region. Take a look at how Palmerston North City Council are using their Geo-Guide Gallery to index a Public Art Guide StoryMap promoting city vibrancy. Share accurate property records, visualize land ownership and encourage self-service mapping for your public users. See how the Wellington City Council Property Map enables ratepayers to easily explore up to date property information. Identify and monitor land use, zoning, and other regulations that impact the environment and use of land. 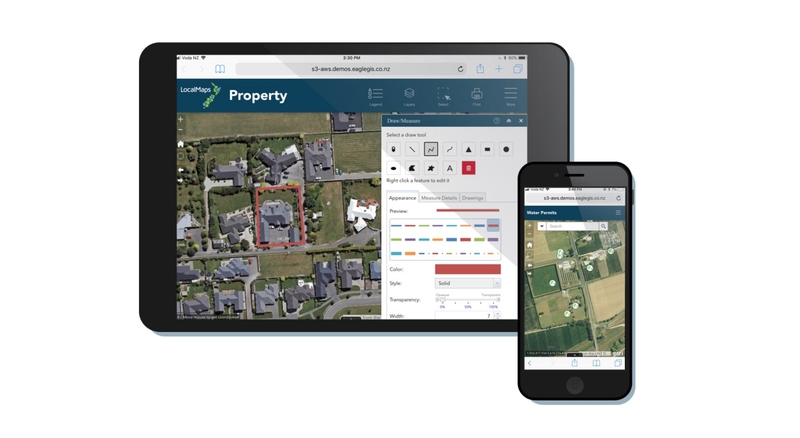 Hawkes Bay Regional Council are using LocalMaps to easily generate reports on Property land use in the region. Organise and visualize assets, improve the operations of your utility network and communicate with customers. Napier Ports LocalMaps provides a visual overview of operation to improve efficiency and increase location awareness. Analyse at risk areas and communities, determine potential impacts and inform the public on evacuation plans. See how finding and accessing the city's Emergency, hazard and evacuation information is simple and intuitive for Wellingtonians. Provide staff or the public instant access to the information they need, wherever they are. LocalMaps is enabling Property Contractors to quickly give on-site quotes by tracing measurements of a new building or house.